After dropping two in a row for the first time all season, the University of Wisconsin men’s basketball team rebounded with a statement win over No. 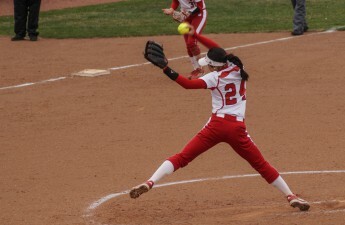 23 Maryland at home Sunday with Big Ten title implications on the line. The No. 11 Badgers (22-5, 11-3 Big Ten) battled back and forth with Maryland between minor lead changes throughout the majority of the first half. The offensive production by both teams quickly turned into a competition between Wisconsin forwards Ethan Happ and Nigel Hayes, and Maryland’s star guard Melo Trimble. UW’s two star big men combined for 16 points and 5 rebounds for the Badgers, while Trimble went 5-of-8 from the floor with 15 points for the Terrapins. Trimble began to take charge in the final moments of the first half, sinking back-to-back 3-pointers for Maryland on their final two possessions and giving the Terps a 6-point cushion heading into the locker room. To the surprise of many, senior guard Bronson Koenig entered the game to replace freshman guard D’Mitrik Trice barely five minutes into the first half. Wisconsin head coach Greg Gard announced Saturday Trice would be starting in place of the injured (calf) senior guard Bronson Koenig. “Not knowing how good Bronson was going to be [Sunday], I decided yesterday that Trice was going to start regardless,” Gard said. Koenig had started 85 consecutive games for the Badgers – a streak that began in the 2014-15 season – prior to missing Wisconsin’s loss to Michigan last Thursday night. Koenig was a nonfactor in the first half to say the least. The Badgers second-leading scorer logged a full 14 minutes but was held to zero FG from the floor despite three attempts. Luckily for Koenig and the Badgers, there’s always a second half in basketball. While Koenig returned to the court in the first half as a player, the second half witnessed the return of Bronson Koenig as a scorer. In a span of 37 seconds, Koenig nailed his first 3-point attempt of the half to tie the Terps at 36 before taking the ball back down the court and draining a long two to give UW its first lead of the half — a lead Wisconsin wouldn’t surrender for the remainder of the game. 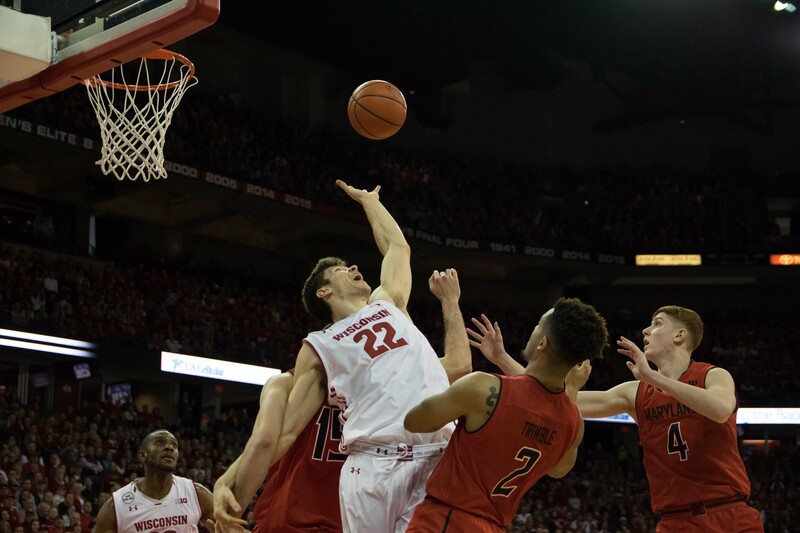 Koenig’s offensive boost came during a 9-0 Wisconsin run, over which the Badgers knocked down five consecutive baskets as part of a 7-of-11 shooting stretch. Yet, thanks to Trimble’s 27 points and debilitating 3-point accuracy, the Terps weren’t ready to go quietly. Halfway through the second half, Maryland had sliced Wisconsin’s lead down to a mere 3 points as fouls became a problem for both teams. Sunday’s game against Maryland witnessed more foul calls (48) than the Badgers have seen all season. The foul charges weren’t limited to the players either. With a 4-point game at just less than 9:30 to go, Maryland head coach Mark Turgeon was issued a technical foul after throwing a fit of rage while voicing his displeasure with the officiating. With less than eight minutes remaining, two key big men from each team – including three starters ­– were forced to ride the pine as spectators with four fouls each. Maryland starting forward Damonte Dodd’s foul trouble held the 6-foot-11 senior to only 14 minutes on the floor with zero points to show for it. For Wisconsin, Sunday’s game was won from the paint. While both teams were plagued with excessive fouls, Wisconsin’s star forwards Happ and Hayes dominated the Terrapins around the rim. Nigel Hayes finished with a double-double (21 points, 10 boards) and with the addition of Happ’s performance the pair combined for 41 points and 17 boards, along with 25 trips to the free throw line. While Hayes and Happ headlined the win, redshirt freshman guard Brevin Pritzl’s performance was perhaps the story of second half for the Badgers. The redshirt freshman guard totaled 23 critical minutes off the bench, and his seven rebounds plus seven assists brought an added electricity to the Badgers game toward the end of both halves. As Trimble’s buckets kept falling, Maryland brought it within four points with less than seven and a half minutes left until a second effort by Pritzl on an offensive rebound kicked off a Badgers 8-0 run to seal the game. This late game push was enough to prompt Maryland head coach Mark Turgeon to pull Trimble from the game for the final four and half minutes of his team’s loss. In the absence of their star player, the Terps finished the game riding a near seven-minute drought without a basket before a layup finally fell with 25 seconds remaining. Wisconsin ended the second half with only one turnover, which was committed with less than two minutes remaining, compared to seven in the first half.